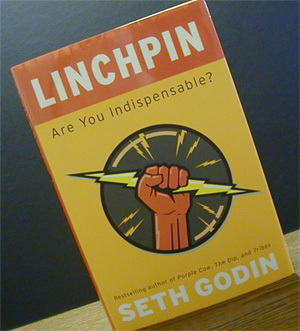 Received my advance copy of Seth Godin’s new book Linchpin yesterday and cracked the cover last night to begin my journey into “The New World of Work”. To get the advanced copy (public copy should be out on the 26th of January) I was one of the fortunate people to get in on Seth’s experiment. He asked 3,000 people to donate at least $30 to The Acumen Fund and he would send a copy to you at his expense. That means all proceeds raised went directly to The Acumen Fund – cool. I’m gonna save my review for later but here’s a teaser. Chapter one takes you on a journey through what was the norm for jobs, businesses and factories and lays the ground work for what is to come (hint: look out it is already here). Hold onto your seats because it’s gonna be a bumpy ride (for the good) as you begin to transform yourself into a Linchpin. You can order a copy from my Amazon Store (affiliate links) under books.